Behavioral studies have often examined parental care by measuring phenotypic plasticity of behavior within a species. Phylogenetic studies have compared parental care among species, but only at broad categories (e.g., care vs. no care). Here we provide a detailed account that integrates phylogenetic analysis with quantitative behavioral data to better understand parental care behavior in the Cuatro Ciénegas cichlid, Herichthys minckleyi. We found that H. minckleyi occurs in a clade of sexually monochromatic or weakly dichromatic monogamous species, but that male and female H. minckleyi have dramatically different reproductive coloration patterns, likely as a result of sexual selection. Furthermore, we found that males are polygynous; large males guard large territories, and smaller males may attempt alternative mating tactics (sneaking). 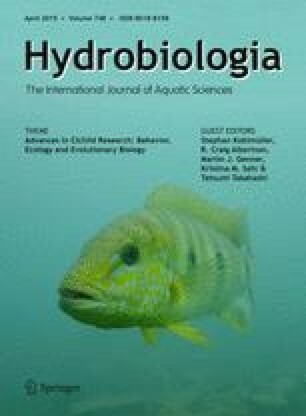 Finally, compared to the closely related monogamous Rio Grande cichlid, H. cyanoguttatus, males of H. minckleyi were present at their nests less often and performed lower rates of aggressive offspring defense, and females compensated for the absence of their mates by performing higher levels of offspring defense. Body color, mating system, and parental care in H. minckleyi appear to have evolved after it colonized Cuatro Ciénegas, and are likely a result of evolution in an isolated, stable environment. The online version of this article (doi: 10.1007/s10750-014-2081-4) contains supplementary material, which is available to authorized users. We thank Laura Alberici da Barbiano, Chelsea Blake, Caitlin Gabor, Jorge L. Hurtado-Gonzales, Michael Jennions, Hanna Kokko, Diane Neudorf, and Amanda Winn for their helpful comments on the manuscript. The Texas Natural History Collections at the University of Texas at Austin and the University of Michigan Museum of Zoology provided access to specimens. This work was supported by an Engineering Plus National Science Foundation—ADVANCE Opportunity Grant (R.G.O. ); by the Teresa Lozano Long Institute of Latin American Studies at the University of Texas at Austin from funds granted to the Institute by the Andrew W. Mellon Foundation (D.A.H. ); by the National Science Foundation Grants DEB-0916695 and DEB-1354149 (P.C. ); and by the National Science Foundation Grant IOS-0843712, an Alfred P. Sloan Foundation Fellowship, the Dwight W. and Blanche Faye Reeder Centennial Fellowship in Systematic and Evolutionary Biology, and an Institute for Cellular & Molecular Biology Fellowship (H.A.H.). Artigas Azas, J. M., 1992. The Herichthys labridens species group. The Cichlid Room Companion. http://www.cichlidae.com/article.php?id=6. Viewed 13 June 2011. Gonzalez-Voyer, A. & N. Kolm, 2010. Parental care and investment. In Encyclopedia of Life Sciences (ELS). Wiley, Chichester. doi: 10.1002/9780470015902.a0021907. IUCN, 2013. IUCN Red List of Threatened Species, Version 2013.2. www.iucnredlist.org. Downloaded on 31 May 2014. Maddison, W. P. & D. R. Maddison, 2011. Mesquite: A Modular System for Evolutionary Analysis, Version 2.75 http://mesquiteproject.org. Rambaut, A. & A. J. Drummond, 2009. Tracer v1.5. http://beast.bio.ed.ac.uk/Tracer. Viewed 28 February 2013.